A fter mixed response from the EPC (engineering, procurement and construction) and BOT-Annuity (build, own, transfer) model, the road sector in India is exploring the Hybrid Annuity Model (HAM) for roadways construction. In HAM, 40 percent of the project cost is provided by the government as ‘construction support’, while the private developers invest 60 percent. Developers get their returns on their invested 60 percent in the form of annuity payments from the government over the concession period. Toll collection rests with the government and there is separate provision for operation and maintenance payments. It is believed that HAM created a conducive ground for the private players to return to the road sector and provided much needed opportunity for the small and medium players too. In this euphoria, the government went on bidding a large number of projects under HAM for road development. In 2017-18, the National Highways Authority of India (NHAI) awarded 3,396 km of HAM projects valued at Rs 76,500 crore as compared with 2,434 km and Rs 36,300 crore in 2016-17. This resulted in a backward pressure on the banking system that is already struggling with huge non-performing assets (NPAs). Commercial banks have already hit their ceiling limit for the sector and are not in a position for further lending. Fresh demands for debts are coming from the new players who have nil or limited exposure to the sector. Though, they are enthusiastic, they lack experience and are not acquainted with sector dynamics, which dent their chances of raising funds. Most of the existing players are over-leveraged and do not have the bandwidth to take additional loads. What should be a right mix of HAM projects in the NHAI’s portfolio? Should there be a better laid out criteria and design for the projects to be bided out on HAM model? As HAM model provides an additional security and comfort to the private players, should there be special guidelines and procedures to bid projects under this model? Can this model be replicated for other sectors like creation of sustainable infrastructure in water and sanitation, health and education? By the end of 2014, there were 400 stalled road projects with a locked investment of Rs 3.85 lakh crore on the verge of becoming NPAs. Reasons for the growing NPAs in the sector inlcude right of way issues, long drawn litigations pending in courts, project completion time escalation due to pending clearances, etc. A huge capital is locked in these projects and assets cannot be monetised. As a result, private players are reluctant to further invest in the sector and have developed cold feet. Sensing trouble, the road ministry has come out with a proposal to bid out only those projects where 80 percent right of way is available. This has alleviated some concerns of the private players and built confidence among the developers and lenders. This coupled with the HAM model again attracted investors and developers. Slowly the road sector has picked up growth. Currently there are 1,837 projects covering 61,164 km of total length and cumulative value of Rs 6.5 lakh crore. The portfolio of NHAI, which constituted only 10 percent of HAM models in 2015-16, has increased to 50 percent in 2017-18. There is an order value growth from Rs 7,000 crore to Rs 76,500 crore from 2014-15 to 2017-18. The revival in the road sector saw an unprecedented growth in medium-sized developers participating in the bids. Road sector competitive bids witnessed on an average of 8 to 12 bids per project. The entry of small and mid-level players succeeded to create the required momentum in the sector. Players which traditionally focused on BOT and EPC projects have modified their strategy and started bidding for HAM projects too. The road ministry’s asset monetisation initiative under toll operate transfer model has garnered a good amount for NHAI. It fetched Rs 9,681 crore for the 700 km bided out in Andhra Pradesh and Gujarat in the first round. It is expected to fetch Rs 6,900 crore in the second round of auction. NHAI has a budgetary support of Rs 71,000 crore for 2018-19 and it is also poised to raise around Rs 62,000 crore through long term bonds for 2018-19. All these factors attribute for NHAI’s aggressiveness to bid out fresh projects under EPC and HAM. The healthy balance sheet created confidence among developers and lenders about timely payment. But a large number of projects under HAM imposed a significant financial burden on NHAI also. Though prima facie the HAM sounds a lucrative option for developers as the financing risk is reduced, the volume of projects and consequent investment requirement puts pressure on commercial banks and financing institutions as developers approach them for funds at the same time. Constrained by liquidity concerns and overexposure, banks are shutting their doors. The initial signs of depression are clearly visible as projects are getting stuck due to financial closure not happening at right time. The average or below average credit rating of small and medium developers is also not helping them to raise funds from the capital market. Most small and mid-size developers were unable to provide bank guarantees owing to their weak financials and banks were unwilling to take additional risk by financing them. These challenges coupled with other issues like poor design of concession agreements, non-flexibility in renegotiation, and collection risks are putting road projects on a standstill. This crisis-like situation is now putting additional pressure on the government to go back to the EPC model for fresh awards. The government is willing to help project developers achieve financial closure at the earliest. In its efforts, the government, along with NHAI, is approaching several banks and other financing institutions to find a way for raising funds. 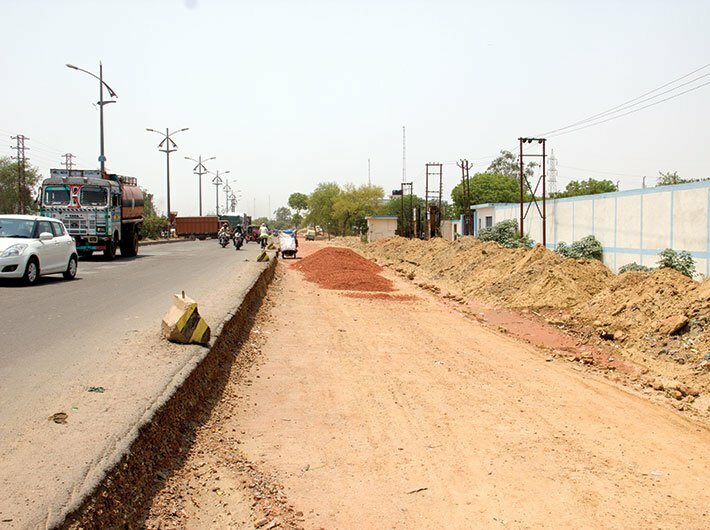 It is also exploring ways to take over some selective projects to be funded by NHAI, but technically it seems difficult as it will amount to favouritism and bias towards some developers. It may also look for increasing its share of construction capital but whether that would help the developers to raise the balanced capital remains a larger concern and in doing so, there is a danger of projects moving towards to the EPC model which might draw criticism. In this scenario, it is exploring ways for tweaking the concession agreements and allowing the project developers to sell some stake in the project to raise funds. It might attract wrath of other loosing competitors and end up in litigation. So, overall the government is now in a Catch 22 situation. The only way out is to go for EPC contracts for future projects and allow the already bided projects to lapse under the contract to go for fresh bidding under EPC route. This would result in waste of time and effort – a risk for government in an election year. Bidding out more projects on HAM basis does not necessarily make sense until the funding concerns are addressed and execution capacity catching up in the Indian market. The government needs to draw a clear line on which projects it would want the HAM and should come forward with a matrix for selection of such projects. As the risk is getting reduced for such type of projects, asking for stringent qualifications (leaving out the over-leveraged players and new entrants); financially and technically, would make sense as government wants to complete some strategic important road projects quickly. A stage-wise approach for identification of projects, filtering them under certain criteria and ranking them would be a good indicator to start with. Though the government is running out of time as the election approaches in 2019, it cannot help much for the projects which are not closing financially. So, it may devise a strategy to have a portfolio approach for future projects under HAM. It should divide all projects under three groups as ‘strategically important and must do’, ‘important and medium term target’ and ‘not so important and can wait’ categories. Top-most priority should be given to strategically important projects and stricter timeline should be drawn to complete these projects quickly and it may be targeted under HAM, if not EPC. In the wake of funding concerns, it is time for NHAI and the ministry to take a pragmatic view of awarding projects under HAM model and decide on a suitable portfolio based on a mix of EPC, BOT annuity and HAM model. It should evaluate the projects on case to case basis and based on top-most priority. NHAI should come forward with a priority index of identifying various road projects based on several parameters including sustainability issues, commercial viability, load density growth, economic empowerment of the region. Along with this, there is a serious need to establish ‘infrastructure-specific finance institutions’ for long term infrastructure projects which can customise their financing to longer term projects with different payment structures and risk based interest rates. Also, innovative and alternative financing options such as pooled funds, pension based funds and establishment of infrastructure investment trusts (InVITs) may be explored for long term financing concerns. Tripathy is a senior fellow at CUTS Institute for Regulation and Competition and a PhD scholar at Rajiv Gandhi Institute for Petroleum and Technology.